Good maintenance of your pool and spa water requires knowledge, time and money. In the battle against cloudy water and debris on the walls of your pool, you have to measure almost every day values like pH, Alkalinity and Chlorine, which is time consuming. At the long term also calcium problems can appear and will damage your expensive equipment like heater elements, valves and pumps, which increases the maintenance costs. On user manuals, consumers are informed about the dosage rates of different maintenance products, but what about knowledge of how bacteria behave themselves in an aquatic environment? And, when finally everything is okay and it is visible a nice looking pool or spa with crystal clear water, you become irritated by still having heavy chlorine smell. Aquafinesse researchers were able to address the most important issues about water treatment. The source of bacteria, how they behave, how they live and survive under different circumstances. Once it became obviously clear, the real cause of bacteria: that they are multiplying and growing on the walls, protected against chlorine within a slimy layer, scientists have found a way to open this slimy layer, so called biofilm, and make the bacteria vulnerable to chlorine. This so called biofilm is dangerous and shelters all kind of bacteria. Never before this issue was addressed until AquaFinesse was invented. Due to the fact that AquaFinesse cleans up the walls and tubes in pools and spas, does also mean that there are less bacteria in the water for the simple reason that their shelter has been opened and removed. They cannot eat, breath or survive without the biofilm. Because of health reasons we all want to use as less harsh chemicals as possible. By reducing the amount of bacteria in the water, avoiding re-growth and multiply of bacteria in the biofilm, you still want to be safe in your pool or spa water. With AquaFinesse the reduction of harsh chemicals is a fact and proven by tests. Keeping the whole system clean avoids unwanted explosions of bacteria growth. Governments in all countries want to “green up” water care, but it is not possible to get safe results without a sanitizer. 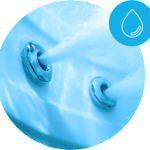 Hypochlorite is still the best available sanitizer and a need for a safe water environment. But you can reduce the sanitizer consumption (free chlorine) for the reason that if there is less debris and bacteria, your free chlorine stays much longer active. 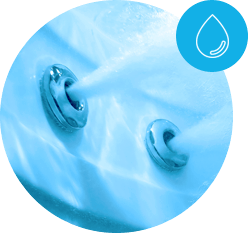 As AquaFinesse is a composition of salts, working in a synergy with each other and able to open and loosen biofilm, it is not only possible to reduce the amount of chlorine, but also to avoid too much bound chlorine which causes red eyes and respiratory irritation. Maintaining your spa and pool water is a matter of knowledge. Combine Aquafinesse with a good sanitizer like chlorine and you will see that the water becomes crystal clear, clean walls and tubing, no dirt on the water line, no excessive and persistent foam, no musky odors, no cloudy water, no strong halogen smell, meaning high levels of halogenated disinfection by products. Besides the unbelievable bather experience you will have. Take a chance and try it once! You will notice the difference!